The right wing merger didn’t get a lot of Canadians excited. There weren’t protests in the streets. Canadians outside the Ottawa bubble may not have even been aware it was going on. If they did, few immediately recognized it as the game changer that it was – after all, right wing parties in Canada changed their name and their leaders every few years. And it seemed unlikely they would even change their leader this time. So former future Prime Minister Bernard Lord and a slew of other high profile candidates yawned and took a pass, letting Stephen Harper walk over Belinda “Bake a Bigger Economic Pie” Stronach and Tony “Never Get Tired of Losing” Clement. Most assumed Stephen Harper could never become Prime Minister – hell, he was the Canadian Alliance leader. And he was from Calgary. We all knew Ontarians would never vote for him. The thought of Quebecers doing that was laughable. Because, after all, the Alberta firewall guy was up against the Paul Martin juggernaut. One of Martin’s top Alberta organizers was going around the 2003 leadership convention telling everyone that, merger or no merger, the Liberals were going to win 9 seats in Alberta next election. I still have my Paulberta t-shirt, as an ironic keepsake. Everyone just knew Paul Martin was going to win 200 seats. It turns out he barely did…it just took him 2 elections to do it. So it’s fair to say the merger didn’t really grip the nation the same way the coalition or the Stronach floor crossing did. Sure, we enjoyed watching David Orchard and Joe Clark huff and puff. Scott Brison joining the Liberals was kind of interesting, but all it did was reinforce the feeling that a Martin landslide was inevitable. Let’s face it, this wasn’t political theater of the highest caliber. But in retrospect, it proved to be one of the most important events of the decade. Because, to pick a moment of the decade, you really need to think about what the decade was all about. The story of the 90s was the Liberals balancing the financial and national unity books. The story of the 80s was Brian Mulroney's rise to power and what he did there. For the 00s, the overarching political narrative was the fall of the Liberals and the rise of Stephen Harper. The event that made it all possible was the merger. And that, is why I suspect it was voted the political moment of the decade. You can see the full results here. Thanks to everyone who voted - I had a lot of fun with this one, and I must say the final list is very close to the top 10 list I'd have produced if I did this myself. Excellent and a job well done, Dan! I've really enjoyed the commentary and discussions this Top Ten has brought about - I look forward to more in the future! By Volkov, at 9:31 a.m.
Definitely a fun vote, since I remember most of these events quite clearly. I didn't vote for the merger, but it did certainly impact politics in Canada. Without it, who knows what would have happened? By Jeff, at 9:38 a.m. In the post-Trudeau era, the Liberals have never won a majority when the Conservatives are united. The adding of seats to Parliament in Ontario and the west will make it harder for the Liberals to get a majority. By nuna d. above, at 12:10 p.m. Agreed. Which is why the Liberal Party needs to make itself relevant to the west. Unless they can win seats in Vancouver, Winnipeg, Regina, Edmonton, Vancouver Island and, yes, even Calgary, the majority math becomes very tricky for the Liberals. If outright lying and trickery are admirable traits, those two guys are superstars. 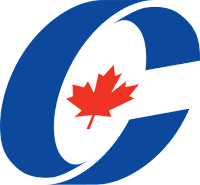 By double nickel, at 1:36 p.m.
By nixtuff, at 1:57 p.m.
To me the merger, while a big deal, was also somewhat inevitable - it is easy to forget that a unified Conservative party has been the norm in Canadian politics. That it took as long as it did to happen is testament to the power of ego. Yet the return of our democracy to equilibrium highlights one thing very clearly - stable forward-thinking government in Canada can only result from temporary aberrations (like the divisions in the right, or Mulroney's unwieldy coalition of enemies plus Turner's ineptness). This goes beyond whether or not the Liberals can win a majority - nobody is likely to win a majority and to hold it for long. We need to change our institutions in order to fix this problem or we will become nothing more than a frigid, less cultured Italy. By hosertohoosier, at 4:16 p.m.
What if this hadn't happened? 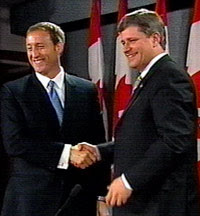 What if we went into the 2004 election with both the Harper-led Canadian Alliance and the Mackay-led Progressive Conservatives? When the sponsorship scandal first broke out, would Canadians have stayed home, seeing no voting option that would replace the Liberal government? Would the two parties split the votes to the extent that the Liberals could still form a majority government even with a big drop in support? Would some of the voters who had either stayed home or voted Liberal have casted their vote for the Progressive Conservatives instead, had they existed? How would the votes have been divided between the Canadian Alliance and the Progressive Conservatives, and what would have that done to the seat count? Would the Canadian Alliance have been viewed as a dead-end regional party, allowing the Progressive Conservatives, backed by Prentice, Mackay, Brison, Bachand and Orchard, become the new Official Opposition? By Robert Vollman, at 5:34 p.m.
Good call. I think the merger is one of the least discussed and most important events in Canadian political history. It produced the Harper government, and Joe Clark called it "The death of a family." Crises come and crises go, but the merger was a sea change in Canadian politics. By James Bowie, at 6:31 p.m.
What if we went into the 2004 election with both the Harper-led Canadian Alliance and the Mackay-led Progressive Conservatives?" That is a very interesting question. I answered it but got a little carried away. 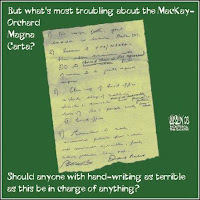 I ended up writing an alternate history of the decade (I posted it on my blog because it exceeded the character limit of the comment box here hosertohoosier.blogspot.com). By hosertohoosier, at 9:20 p.m.
My view on the "what if" of no merger is that the "merger" process would have happened much more slowly. In 2004 I actually see the PC party rebounding and winning a dozen or so seats in Ontario, but the Alliance would have been able to win much more. The question needs to be why no merger, and I answered that with a Brison leadership (the 3 crucial votes - for anyone that remembers). 2006 would have, IMO, resulted in the Liberals winning more seats than the Alliance, but the Alliance, PC Party, and Bloc (and thanks to #2 on our list, we know this was indeed planned) would have cobbled together a short lived government, giving Harper a year or two to prove he's not scary. By 2010, the only real difference we'd see is that all the Conservative seats from NL, NS, and PE would be PC. The Alliance would have one, perhaps two seats in NB (the rest PC) and the Liberals would have a dozen more seats in Ontario at the Alliance (Cons) expense. I do think, however, that the Alliance would have become the new party of the right, however scary we thought it was way back when. By nixtuff, at 3:40 a.m.
By nixtuff, at 3:44 a.m. It all depends whether or not Martin hangs on for his majority in 2004 or not. I'm not convinced he would have, but let's say he does. That lets him ride out adscam and we'd get a full term under Martin to fullfill all of his priorities. With his re-election election likely before the economic collapse, he'd be in good shape to get re-elected, but we would be at 18 years of Liberal government by then - you have to think the "time for a change" vibe would be strong. And it seems unlikely that there wouldn't be some sort of right wing agreement not to run against each other, if not a merger, by 2008 if Martin had won a majority in 2004. So maybe Martin loses in 2008. But then, who replaces him? It would really come down to who had distinguished themselves in Cabinet during the Martin years and that's anybody's guess. By calgarygrit, at 3:53 p.m.
Oh, and just to add, I tend to think Martin would have still gotten a minority in 2004. There was such a strong "punish the Liberals" message out there, that he couldn't have gotten the majority. Remember, there was some bounce-back at the end because people were afraid of Harper. If we all assumed the Libs would win and there was a benign vote option like the PCs, the Liberals would probably have gotten 3-5% less and that spells minority no matter how you slice it. So, at that point, it really depends on what the right wingers did. If they dodmatically stayed divided, Martin could have probably won another minority in 2006, but you have to think they'd cut some sort of deal. By calgarygrit, at 3:58 p.m. The math on a divided right is really really bad though. Lets look at Ontario, using the UBC voter migration matrix. Assumptions: Liberal gains come from Alliance; PC gains come from Alliance; NDP gains come from Liberals. With these kinds of numbers, you are talking about 101 Liberal seats and maybe 2 NDP ones (Comartin's Windsor seat and Trinity-Spadina). (I am making assumptions that are extremely generous to the broke PC party, which is unfavourable to my own conclusion of a Martin majority). How big a loss will it take to give the Liberals Martin-like seat totals (in the real 2004 election Martin won 45% of the vote in Ontario and 75 seats)? Note that here we are assuming a combined right-wing vote of 44% (the real Tories won 32%). How low would the Liberals need to go to get below 50 seats? So here the combined right has 47% of the vote (a feat matched only by Mulroney in 1984 and Dief in 1958), yet wins about as many seats as Harper did in 2006 (with 35% of the vote). By hosertohoosier, at 6:11 p.m. Thanks for the this post. There are several things I need to know via this discussion! By Data recovery software, at 2:22 a.m.
By Buy cialis, at 3:35 p.m. I am far from politics and can't get all these pecularities. Even for my college, for the political science I follow my friends-students advice – applying to top 5 writing services review to find out about most reputable essay writing services for academics. By top 5 writing services review, at 5:48 p.m.
By Ahmad Wahyudin, at 1:56 p.m.
By jeje, at 4:01 a.m.
By Unknown, at 9:44 p.m.
By learn to fly 2, at 8:38 p.m.
By good days, at 3:00 p.m.
By nader galal, at 8:59 p.m.
By nader galal, at 9:00 p.m.
By nader galal, at 9:02 p.m.
By Stjsrty Xtjsrty, at 10:40 p.m.
By elkamaal elkamaal., at 8:40 p.m.
By elkamaal elkamaal., at 8:55 p.m.
By elkamaal elkamaal., at 8:59 p.m.
By elkamaal elkamaal., at 9:03 p.m.
By elkamaal elkamaal., at 9:09 p.m.
By elkamaal elkamaal., at 9:14 p.m.
By elkamaal elkamaal., at 9:17 p.m.
By elkamaal elkamaal., at 9:18 p.m.
By elkamaal elkamaal., at 9:21 p.m.
By Muhammad Syahrul, at 4:12 a.m.
By Rani Anggraeni, at 2:32 a.m.
By Anisa Marlina, at 8:34 p.m.